Chimewall is a musical instrument designed for the dynamics of the street. Next month, the 250,000 daily travelers along Market Street — San Francisco’s three-mile-long central artery — will discover some new attractions along their commutes. Near the Embarcadero, a metal wall six feet tall and eight feet long will chime when touched or tapped. 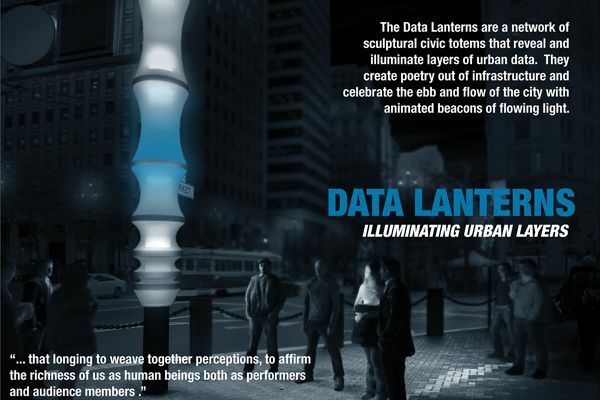 In the Financial District, “Data Lanterns” will draw on transit and other public data feeds to glow in response to arriving trains. A little further down the street, near the city’s Civic Center, billowing sheets of fabric will evoke a more tactile version of fog, while a street theater with seats made of compacted mushrooms will be composted after use. These are just four of the fifty finalists in the Market Street Prototyping Festival, a novel effort to engage local designers, artists, and residents of surrounding neighborhoods in the remaking of thirty-six blocks of Market Street ahead of its planned reconstruction in 2018. For three days in April, the public will play-test their projects, offering feedback that will be used to select concepts to include in the final design. The festival is also a prototype in its own right for a Bay Area strain of tactical urbanism that neither originates purely from above (a la the stealth makeover of Times Square in New York) or below (e.g. painting your own bike lanes), but tries to occupy middle ground. In this iteration of tactical urbanism, city planners commission ideas from citizens, iterate their designs with the help of community and professional partners, and incorporate their creations into official plans. The festival’s backers hope the process can become a model for other cities. To answer these questions, Hrushowy’s group partnered with San Francisco’s Yerba Buena Center for the Arts and the John S. and James L. Knight Foundation (which sponsors this column) to produce the festival, which runs from April 9-11. Beginning last spring, the organizers solicited ideas that would improve the street’s public spaces and encourage community engagement — beyond that, teams were free to submit anything they like. In October, they selected fifty finalists, each of which received $2,000 to prototype their design. 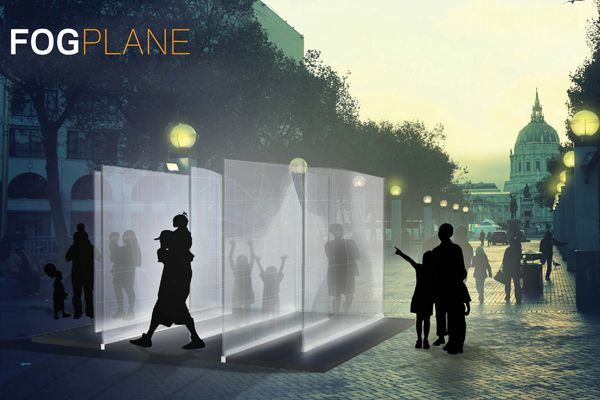 Fogplane is one of the winning prototypes that will come alive on Market Street. The winning teams were then assigned to five “design captains” tasked with overseeing the installations along their respective stretches of the festival’s two-mile route — Autodesk, Gensler, the Exploratorium, the Studio for Urban Projects, and the California College of the Arts. A design charrette in January offered an opportunity for design captains to dispense advice and constructive criticism to their charges while signaling the start of a sprint to the finish in time for the April deadline. 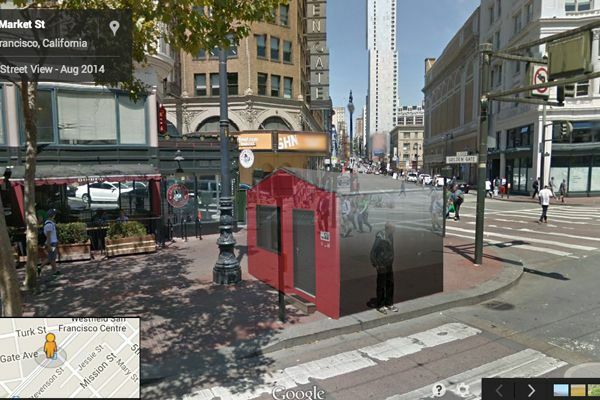 So what should flâneurs expect while strolling along Market Street next month? A “ProtoHouse” by mobile micro-housing evangelist Tim McCormick; the ghosts of San Francisco’s arroyos, the long-buried creeks that once ran through the city after heavy rains; and safety nets for the caterpillars that will one day metamorphose into Western Tiger Swallowtail butterflies, to name just a few. ProtoHouse is an interactive space for rethinking housing models. “ChimeSF” is a metal wall as musical instrument, meant to transform passerby into an impromptu band. 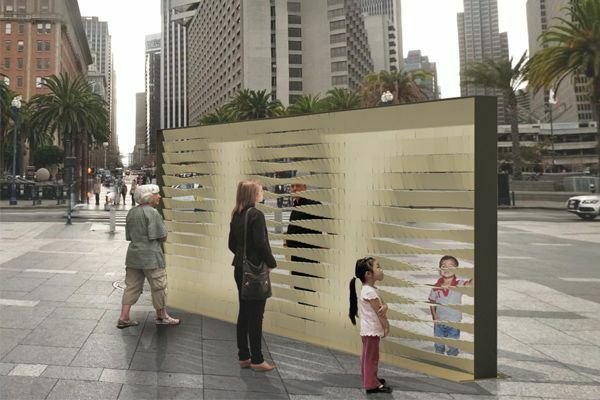 Meanwhile, “MeetWall” uses sensors and spinning tiles to suddenly reveal strangers through a seemingly solid barrier. A quick glance of all fifty finalists slots each of these seemingly divergent ideas into several noticeable trends: musical instruments as street furniture; data visualization (or physicalization); bio-mimicry; performance, and outdoor sports. Whether any of these meets with widespread acclaim is almost beside the point. Hrushowy is more concerned what he calls “a new relationship between public design and the public,” scaling up tactical urbanism exercises such as parklets and letting them inform long-term planning. To that end, Gehl Studio (a collaborator on this column) will lead an evaluation of the festival, counting, interviewing, and observing people as they engage with the event, and looking at the new relationships forged between public, private, and nonprofit collaborators. Working with city officials, Gehl will investigate how lessons learned from this weekend event can be applied to medium and long-term investments not only along Market Street, but also in other places and in conjunction with other efforts throughout San Francisco.